On the Tuesday before Thanksgiving, a federal district judge in Texas issued a nationwide preliminary injunction blocking – at least temporarily – the implementation and enforcement of the Overtime Final Rule that was slated to take effect December 1, 2016. The judge ruled that the U.S. Department of Labor exceeded its authority when it issued regulations in May (the “Overtime Final Rule”) that changed the criteria for determining which employees are bona fide executives, administrative personnel, or professionals "exempt" from being paid overtime (commonly called the “white collar exemption”) by revising the salary threshold that triggers the exemption. The injunction only halts the new rule from becoming law; it does not change current rights and obligations under the underlying federal wage and hour laws. Nonprofit and other employers still must comply with existing federal and state laws regarding fair labor standards, including properly classifying employees as being exempt from or entitled to being paid overtime. For more information on the overtime rule and the lawsuit, read the Special Edition of Nonprofit Knowledge Matters, published on November 23. The court ruling creates doubts for employers and employees as to what comes next regarding the Overtime Final Rule. The likely next steps in the litigation are for the district court to issue a permanent injunction, the federal government appeals that decision to the Fifth Circuit Court of Appeals, and possibly the U.S. Supreme Court. This process could be expedited so the matter is decided on the merits or allowed to drag out until after President-Elect Trump is inaugurated, at which time he could instruct government lawyers to change their position in the lawsuit. If the courts allow the Overtime Final Rule to take effect by mid-January, the usual procedures for repealing existing regulations – passing legislation or rewriting the regulation pursuant to the time-consuming Administrative Procedures Act – would have to be followed by Congress and the new Administration. And, regardless of the timing in the litigation, if the current Congress adjourns sine die early enough in December, the new Congress that convenes on January 3 could invoke the 1996 Congressional Review Act to block the regulation from ever taking effect. This is because there would have been less than 60 legislative days between the publication of the final rule and the adjournment of Congress. The November 8 elections produced some distinct surprises while also continuing numerous trends seen in recent years across the states. Early pronouncements from incoming and re-elected office holders suggest that policy decisions will be not only top-down from the federal government, but also bottom-up from localities and spread horizontally from one state to others. Actions by Congress on issues like healthcare, such as altering the Affordable Care Act, will directly affect state finances – and impact the work of nonprofits beyond just those providing healthcare. State and local ballot measures on minimum wage and other policies will put pressure on Congress and other states to adjust employment laws – and affect the work of nonprofits as employers. The spread of trifecta government at the state level – as in one party controlling the governorship and majorities in both the state House and Senate – may escalate a trend among states to adopt austerity budgets and tax plans that undermine their long-term fiscal stability. Read the full analysis from the National Council of Nonprofits, The 2016 Elections: Impact on the Work of Charitable Nonprofits. The main drama in the post-election lame-duck session has been whether the 114th Congress would get all of its work done by the end of the year, or punt some of the tough spending decisions to the new Congress and new President. House Republicans signaled before leaving Washington for Thanksgiving that they have chosen to enact another temporary spending bill that will fund the federal government until the end of March 2017. Democrats in the House and many Senators of both parties had insisted on completing the eleven appropriations bills this year. The House is scheduled to take up a continuing resolution (“CR”) in the coming weeks that maintains the status quo through March 31. The current CR expires on December 9. The House is slated to consider a large bipartisan healthcare bill on Wednesday that includes a House-passed measure to promote social impact partnerships (H.R. 5170) that often involve “pay for success” components. The legislation would instruct the Treasury Department to request proposals from states or local governments for projects that focus on employment for the unemployed between ages 16 and 24, high school graduation, or reduction of teen and unplanned pregnancies as well as incidences and adverse consequences of child abuse and neglect. The program would reserve funds to assist state or local governments with up to 50 percent of the costs of developing feasibility studies to apply for social impact partnership funding and would require an independent evaluation to determine whether the state or local government project has met an outcome specified in the agreement in order for such governments to receive outcome payments. The pay-for-success model, which seeks to attract private investment to scale up new approaches to longstanding problems, is the subject of controversy in many parts of the country due to mixed results. In August, the National Council of Nonprofits released “Principles for Consideration of New Funding Mechanisms,” designed for use by nonprofits, governments, foundations, and for-profit entities when considering launching pay-for-success initiatives, social impact bonds, or other new funding mechanisms. Mandating Pay to Play: Beginning in 2017, nonprofits wanting to participate in the federal employees’ Combined Federal Campaign (CFC) will be required to pay multiple fees to the federal Office of Personnel Management’s program processor. OPM, which announced the new fees on the night after the elections, plans to charge nonprofits new costs that range from upfront fees, listing fees, as well as distribution fees assessed against pledges received. United Way Worldwide has compiled information on the CFC pay to play requirements and is encouraging nonprofits to take action to express concerns. Community Solutions Take Priority: This month, President Obama created the Council on Community Solutions with the purpose of coordinating “efforts at the Federal, regional, State, local, tribal, and community level, and with cross-sector partners, to offer a more seamless process for communities to access needed support and ensure equitable investments.” The new entity does not include any nonprofit representatives, but the Council is instructed to conduct outreach to representatives of nonprofit organizations, business groups, unions, and others “with relevant expertise in the expansion and improvement of efforts to build local capacity, ensure equity, and address economic, social, environmental, and other issues in communities or regions.” See White House fact sheet. IRS Gives Hurricane Matthew Relief: In Notice 2016-69, the IRS provides special relief designed to support leave-based donation programs to aid victims of Hurricane Matthew. Under the program, employees can choose a cash payout made to charitable organizations in lieu of vacation, sick, or personal leave. The Notice explains that the IRS will not consider the payments as gross income or wages, but the employee will not be permitted to deduct the payments as a charitable donation. Court Blocks California AG Disclosure Rule, Again: The federal judge in the case, Thomas More Law Center v. Kamala Harris, permanently enjoined the California Attorney General (and newly elected U.S. Senator) from demanding that charitable 501(c)(3) nonprofits disclose the names of their donors by requiring the filing of unredacted Schedule B forms. The district court judge had previously ruled the Attorney General’s disclosure rule unconstitutional as an infringement of free speech, but that case was reversed on appeal and a trial ordered. In the current iteration of the case, the district court judge ruled that the disclosure requirement is unconstitutional as applied. To address issues causing unnecessary red tape and ineffective delivery of services to citizens of Kentucky, members of a legislative task force on government-nonprofit contracting voted unanimously to recommend reforms to the contracting and auditing processes in the Commonwealth. The Kentucky Task Force on Government Nonprofit Contracting began meeting in July 2016 and heard numerous presentations from nonprofit and government officials about the challenges presented by current processes and rules. It devoted considerable attention to whether governmental agencies have fully and properly implemented the Uniform Guidance grants reforms from the federal Office of Management and Budget. The final recommendations of the Task Force call for continuing the collaborative effort between state agencies and nonprofits to explore four findings. First, Commonwealth procedures should be changed to adopt or mirror all or part of OMB Uniform Guidance regulations. Second, the Commonwealth needs to address gaps between state and federal indirect cost reimbursement rates. Third, the Commonwealth needs to streamline its contracting and auditing processes. Fourth, the government should establish and implement training of the state contracting processes and the OMB Uniform Guidance. The Kentucky Task Force on Government Nonprofit Contracting was established by unanimous approval of the 2015 Kentucky General Assembly as the result of advocacy efforts of the Kentucky Nonprofit Network. What does social worker retention have to do with contracting reform? A lot when making data-driven decisions on social outcomes over the longer term. A well-known study of public sector child welfare social workers, recently cited by Governing Magazine, found that caseworker turnover has a dramatic effect on outcomes. Over a one-year period, children with only one caseworker achieved permanent placements in homes 74.5 percent of the time. When two caseworkers are involved due to turnover, the success rate plummets to 17.5 percent; with three caseworkers, the chance of a child finding a permanent home drops to just 5 percent. Further, high turnover of caseworkers leads to increased training costs: The Texas Senate Finance Committee determined it takes $54,000 to train each new worker. Two of the main factors effecting turnover are low salaries and high caseload size — both of which are the result of underfunding social services. So what does this have to do with government-nonprofit contracting reform? This phenomenon is not limited to public sector caseworkers. Average salaries for nonprofit social workers are 36 percent lower than those in the public sector and the need to do more with less is continually increasing. While the gap between the actual costs to perform services and what governments will reimburse keeps getting larger, there is growing emphasis on measuring outcomes, which also costs money. Contracts and grants that do not reimburse at least actual costs to perform services with enough properly trained and adequately compensated staff ultimately costs everyone — nonprofits, government, taxpayers, and most importantly, those individuals who need services. Rather than spending $54,000 to train each new inexperienced social worker, funds could be spent much more effectively by paying what is needed at the front-end, instead of paying for the constant churning at the back-end caused by lack of adequate funding. Taxes: Local government officials in Ohio are criticizing a business-backed bill in the Legislature that would offer property tax breaks for land purchased for development purposes. The local officials object to the state taking away their taxing options and point out that other taxpayers, typically residential property owners, will be forced to pick up the tab for the land affected by the tax breaks for developers. States and local governments that enter into tax-abatement agreements with businesses and others will soon be required to disclose more information to the public, as the result of new nationwide accounting rules that go into effect in 2017. Under the new rules, state and local governments must report all economic development incentives as foregone tax revenue beginning with their fiscal year 2017 annual financial reports. Specifically, governments will have to disclose the gross dollar amount of corporate tax breaks for economic development and similar activities, any commitments agreed upon, and how the government will get the money back (clawback) if the goals are not achieved, among other things. The amount of foregone tax revenues for tax deals with businesses and others is significant, with estimates for 2012 exceeding $80 billion. The new rules from the Government Accounting Standards Board are designed to encourage transparency while “provid[ing] citizens and taxpayers, legislative and oversight bodies, municipal bond analysts, and others with information they need to evaluate the financial health of governments, make decisions, and assess accountability.” Business tax abatements usually reduce tax revenues to local governments, which often turn to nonprofits to make up the some of the difference by demanding taxes, fees, or payments in lieu of taxes. The new government disclosure rules should enable nonprofits to demonstrate their value to communities in comparison to economic deals struck by local policymakers. The election results this month have created confusion and concern about unknown changes ahead for many in the public and within the nonprofit community. In times like these, communities need leaders. And the leaders of state associations of nonprofits have been stepping up to offer encouragement and guidance for the broader communities they serve. In recent posts, articles, and commentaries, state association executive directors and CEOs have risen to the challenging times by providing inspiration that unites and motivates positive action. Heather Iliff, President & CEO of Maryland Nonprofits, reminds us all that nonprofits have an advantage: “One of the biggest strengths of nonprofit organizations is that we are non-partisan, and can create a space for community problem-solving that is not muddled by political conflict.” In “Five Opportunities for Nonprofits in a Trump Administration,” she offers several bipartisan policy proposals that include government reform, infrastructure, focus on inner cities and rural areas, and deregulation. These and many other nonprofit leaders are demonstrating nonprofit resilience and inspiring others along the way. After all, while elections may change the particular audiences for nonprofit advocacy messages, they don’t alter a nonprofit’s ardor for its mission. 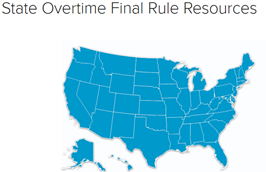 State Overtime Final Rule Resources, National Council of Nonprofits, providing essential information from state associations of nonprofits on how the federal wage and hour laws, including the temporarily enjoined overtime rule, play out in individual states. - Arabella Advisers, writing in Greater Good Blog, November 15, 2016, urging philanthropists to recognize that positive policy action happens at the state and local levels, and not just in Washington, DC. Prop. 206 is a double-edged sword for non-profits, Kristen Merrifield, CEO of the Alliance of Arizona Nonprofits, writing in The Arizona Republic, November 19, 2006, addressing how the minimum wage initiatives approved by voters in Arizona will affect the work of nonprofits in communities. Outcome of Ballot Measures in the 2016 General Election: Impact on State Budgets, National Association of State Budget Officers, November 10, 2016, providing a review of how ballot measures will affect budgeting decisions at the state level. Student Debt Is Hurting the Nonprofit Workforce—and You Can Do Something about It, November 3, 2016, highlighting the challenges of student debt and CalNonprofits’ Nonprofit Student Debt Project to combat the student debt crisis and its impact on nonprofits and the important work they do. Hope for a Student-Debt Free Future for the Nonprofit Workforce—Exactly What Nonprofit Staff and Managers Can Do, November 21, 2016, promoting actions that will boost staff morale, help colleagues get out of student debt, or recruit and retain new talent by embracing the Public Service Loan Forgiveness Program. The articles are written by Nancy Berlin, Christina Dragonetti, Katie Kleinsasser, and Jan Masaoka. The increasingly diverse United States of America, Dan Keating and Laris Karklis, Washington Post, November 25, 2016, analyzing the racial and ethnic diversity of communities across the country, and identifying areas of rapid change. The backlog of unpaid bills owed by the State of Illinois to nonprofits and other vendors of services and goods as the result of failure of the Governor and Legislature to reach agreement on a budget for two years. Source: “Rauner, Madigan feud means state's unpaid bills could reach $13.5 billion,” Monique Garcia, Chicago Tribune, November 16, 2016.